Rob Orlando 4:57,Â Kristan Clever 6:58,Â Rebecca Voigt 8:34,Â Andrea Ager 8:41. – Â Mike F. – 1st Muscle Up!!! This should be an awesome workout to come back to. Today’s as Rx’d = 7:42. The thrusters are a killer. Well today was a DNF–the last 3 muscle ups just didn’t happen, kept pushing but left shoulder took a beating. While disappointed with my performance a year ago I couldn’t do a muscle up so getting there. Live to fight another day. Actually enjoyed the thrusters this morning which is very strange to say. Thanks for the tips Bobby! I’ll keep plugging away at them. 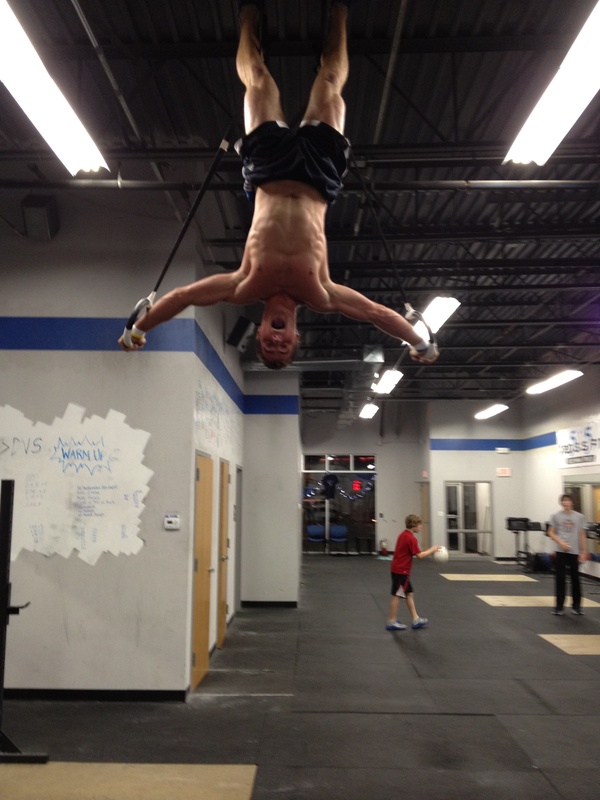 Today’s WOD – 15:13 with muscle up progressions in the blue band and thrusters as rx’d. Felt like the band really helped me get the feel of a muscle up. I’m guessing that I’m still a long ways away from a real muscle up since it was quite hard enough with the band. 210 is a 15# PR for me…now that my knee is better I can feel my lowe body strength finely starting to get better. Props for doing that wod AFTER squats…Noice work! Very frustrating workout this morning. Attempted MUs for 10 min and only got 2 (very ugly) ones. Then did the wod with pull ups and dips, and after struggling through the first round used a purple band for dips. Ugh. Time was 19:40. Lesson: My body was not meant to weigh 135#, and things are about to get real ugly in the next few months. Lindsay , remember this is only a temporary thing, (only 9 months) the joy and good times yet to come from a little 8lb baby, will surpass any of this reshaping of your physique. Stiffin that upper lip your half way through with this. Props to you for your effort to keep coming in the gym. Thanks, Travis 🙂 I knew if I whined I would get some nice sympathy words. I agree! Keep it up girl!